We live in a day where we have some amazing attention getting technology. Much of what we see has one goal in mind, to capture our attention in order to deliver a message. Easter is the one Sunday in the year that many people who have grown weary of church come back to give it one more chance. It is our goal to get their attention in order to deliver a life changing message from God's word. That message has not changed since it was first delivered. The environments in which people receive it has changed with every generation. We have been working to be able to capture the attention of those who come Easter not only for that Sunday, but to get them back. 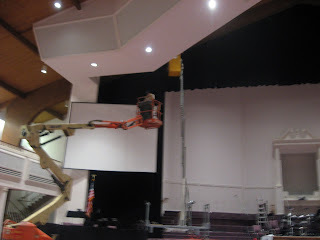 We have reset out screens, added a scrim and will project one of the largest images they would see anywhere in town. We know that while we can work to get people's attention it is still the prayers of God's people, the power of the Word of God and the work of the Holy Spirit in individual hearts that will make a difference. I am looking forward to Easter. We know God has chosen His church and His people to be witness to His story of redemption. Join me in prayer for this Easter Sunday. And wasn't it a fabulous service? And being in choir was amazing!!! The Holy Sprirt walking among us as we sang was indescribable! !